While all eyes are on Syria, there is some news from Japan that caught my eye. Japan’s nuclear regulator on Wednesday upgraded the rating of a leak of radiation-contaminated water from a tank at its tsunami-wrecked nuclear plant to a “serious incident” on an international scale, and it castigated the plant operator for failing to catch the problem earlier. The Nuclear Regulation Authority’s latest criticism of Tokyo Electric Power Co. came a day after the operator of the Fukushima Dai-ichi nuclear plant acknowledged that the 272-tonne (300-ton, 300,000-litre, 80,000-gallon) leak probably began nearly a month and a half before it was discovered Aug. 19. Meanwhile, new scare stories are now circulating in various social media as a result of this level increase, saying there is “no safe level of radiation” and falsely presenting a tsunami-wave-projection graphic as an image of spreading radiation levels. 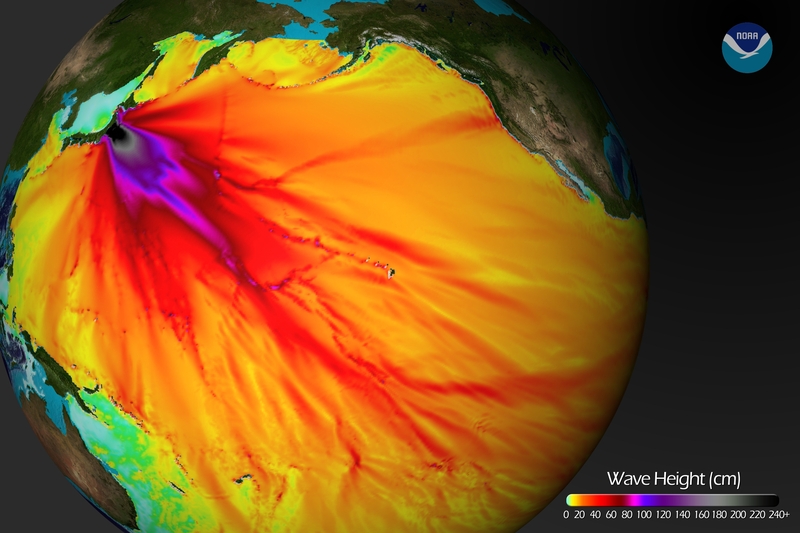 Model projections of wave heights from the 2011 Japan quake. There’s virtually no risk of getting fatal cancer from Pacific bluefin tuna exposed to radiation from the Fukushima nuclear disaster, according to a new study published Monday in the Proceedings of the National Academy of Sciences. The study found that the additional risk is one death per 5 million subsistence fishermen, who eat fish as a dietary staple. For consumers, the risk would be even lower. The complete text can be found by clicking on this link. The Before It’s News article states that “there is no safe level of radiation”. While that is formally true, whether or not a threat is posed depends directly on how much ionizing radiation is present relative to the natural background level. Everyday existence on Earth results in exposure to natural ionizing radiation from cosmic rays and from the elements the Earth is made of. So, it looks like science-based facts counter scary an eco-activist meme, once again. Anyone who believes there is no safe level of radiation exposure should NEVER get on a commercial airplane again. To those who understand that there are varying degrees of risk involved it might be useful to know exactly what kind of radioactive materials are involved, and at what levels. Or, those values can be converted to dosage equivalents (Sieverts) which the U of H report thankfully does. The additional dose from Fukushima radionuclides to humans consuming tainted PBFT in the United States was calculated to be 0.9 and 4.7 µSv for average consumers and subsistence fishermen, respectively. Wikipedia includes a short list of dose examples that may be used as useful comparison. Please note that, according to this information the relative dietary exposure from Fukushima falls somewhere between a single US airport screening (to say nothing of the radiation exposure at altitude) and one set of dental x-rays. And is orders of magnitude lower than one full body CT scan. The sky, it is not falling. Just to make a point: one of the major ingredients used to cleanse radioactive contamination is . . . Dihydrogen Oxide. Yes. That’s right folks; H2O. Now follow along with me. The Pacific Ocean is comprised of . . Water, various salts and trace amounts of other water soluble elements and compounds. It is also used as a reactor moderator as it absorbs ionizing radiation. The most danger from radioactive material incidents is from INGESTION. Either by air (breathing) or by contact (hand to mouth), or direct ingestion (contaminated food or liquid). But then top that all off with the startling amount of radiation that one can absorb and still be safe compared to the tiny amounts that MIGHT be received due to exposure then one should reconsider wondering if you’ll start to glow in the dark from eating some tuna. Now the guys WORKING around that reactor on a daily basis, well that’s a different story but they are also monitored heavily and are volunteers and will not be allowed to continue exposure once they reach the safe limits. This is just Green Hype. I keep pointing the .. more excitable .. members of the cat clan at this. It’s very useful as Munroe (author of XKCD.COM) is not noted as a conservative, eh? It’s not, unfortunately, possible to convince some folks based on, you know, *facts* ..
acat: An excellent chart, indeed. I am bookmarking it. Thanks for sharing it. So glad to know I have absolutely nothing to worry about. Seeing reports about rising radiation levels at Fukushima reported in the Wall Street Journal, CNN, and other mainstream media outlets was getting to me, especially reports about the radioactive plume in the Pacific reaching our coast by 2014. I am sure we will all end up carrying some Fukushima radiation in our bones, as we all carry some of Chernobyl, but as long as it is deemed safe by a scientist or two, I’m with you, no scare tactics are going to ruin my day. Your use, moly, of the phrase “absolutely nothing to worry about” convinces me you’re attempting sarcasm. Your closing comment of “deemed safe by a scientist or two” confirms it. Nothing in the rest of your post convinces me otherwise. Of course there are things to worry about…. but were I in your position, I’d be much more worried about getting in a car wreck, getting mugged, or how to invest my lottery winnings as the odds of all of the above are significantly higher than of you dying early due to Fukushima radiation. Further, there are perfectly obvious steps you can take to minimize the risk – stop eating fish, bananas, and potatoes sourced from areas around the pacific for a start. Finally, there is no way for you to tell whether the radiation in question comes from you going to school in a concrete building, living over a large granite formation, eating a lot of bananas, radium in your water supply, living near a coal power plant, being a frequent flier, or .. Fukushima. There are lots more natural sources of radiation and other harmful chemicals and bacteria and viruses out there than just this one .. mother nature is a stone-cold serial killer. Seriously, spending all your energy getting bent about Fukushima is leaving yourself open for other avenues for her to shiv you, eh? If, on the other paw, you are sincere, then .. you need to learn to write for clarity. Another Alex Jones ship of fools. I’m old enough to remember the alarms over radioactive strontium contamination (from Russian/Chinese nuke testing) in milk during the 50’s. We survived that and the other hand wringing doomers flights of hysteria.